My last photo of the River Seine was taken while looking to the southwest from the Eiffel Tower. In the middle of the photo is the Pont de Bir-Hakeim, which we studied yesterday. 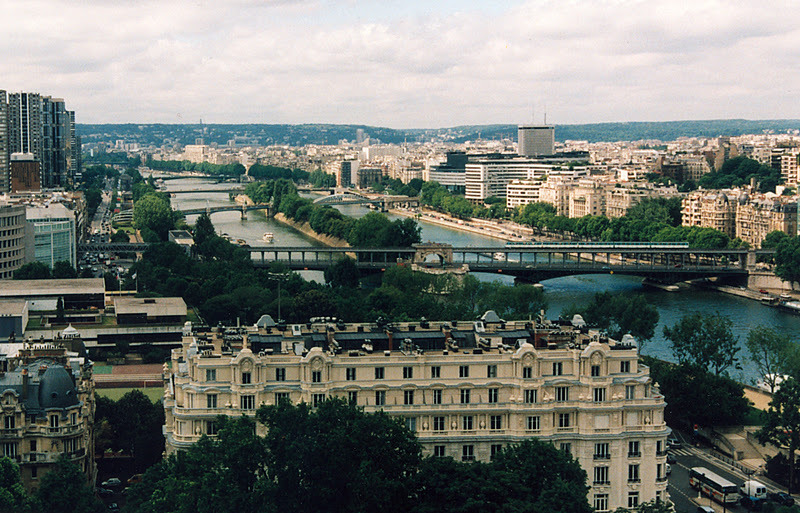 The next bridge is the Pont Rouelle, which is one of the few bridges that cross the Seine on a skew and a curve. It is a railway bridge that was built for the 1900 World's Fair, closed in 1924, and reopened in 1985. It is composed of a stone masonry deck arch on the right bank, an iron through arch across the right side of the Seine, a stone arch on the island, and a four span iron deck arch on a spiral curve across the left side of the Seine. The stone piers and railing were designed in the Art Nouveau style. Its total length is about 370 m (1215 ft). At the south end of the Ile de Cygnes is the Pont de Grenelle, which is a continuous two span steel, haunched girder bridge. It was built in 1966 and replaced a lovely arch bridge that was built in 1873. We can barely see the Pont Mirabeau at the top of the photo, but it is a very attractive three span metal deck arch decorated with statues at the piers. The main span is 93 m (385 ft) long and the approach spans are 32.4 m (106 ft). More information on the Seine River bridges is available from Wikipedia from Structurae or from an excellent book Quais et Ponts de Paris which can be ordered for less than 20 Euros from the French Amazon. Seine River Bridges: Pont de Bir-Hakeim, Pont Rouelle, Pont de Grenelle, and Pont Mirabeau by Mark Yashinsky is licensed under a Creative Commons Attribution-NonCommercial-ShareAlike 3.0 United States License.